LE BOURGET, France -- Everyone held their breath when Russia took the microphone. With a draft outcome of a new global climate change agreement on the table, ready to head to the world's ministers to make final high-level political decisions, the stakes Friday were high. If a country were to block it from moving forward, everything could crumble. Indeed, Russian lead negotiator Oleg Shamanov was angry and denounced the United Nations as "discriminatory" for not translating the text into Russian. Vladimir Chuprov, who heads the energy program at Greenpeace Russia, saw it as a good sign. "It's a good indication that Russia is not going to step in and block," Chuprov said. He stressed that Russia is fighting "secondary" issues rather than joining with Saudi Arabia and others to actively obstruct progress. Whether people realize it or not, he said, that's key. "In Soviet times, you have to read between the lines," Chuprov joked. But pique and procedural fights are the weapon of choice for the Russian Federation. The natural gas and oil giant has been known at the Conferences of the Parties to the U.N. climate convention (COPs) for holding up the approval of agreements because it wasn't invited to the right meeting or huddle -- or sometimes to protect its "hot air," as environmental groups call the country's surplus in emissions allowances. One high-level U.N. official told ClimateWire he's worried that countries aren't giving it enough attention. "I bet this COP will make the mistake which every COP makes, which is to forget about the Russians," the official said. Invariably, on the final night of negotiations, he said, "standing in the middle of the room, feeling completely ignored, is this superpower called Russia. The one thing Russia hates is to be ignored in this process, as we've found out often at 11 o'clock at night. It comes at a price." Observers insist this time may be different. For one thing, when President Vladimir Putin spoke last week at the opening of the climate summit, he declared climate change "one of the gravest challenges humanity is facing." Allies? 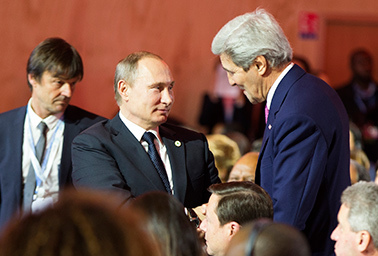 Russian President Vladimir Putin greeted Secretary of State John Kerry last week after a speech by President Obama calling for a new climate agreement. Photo by Evan Vucci, courtesy of AP Images. While he pressed his country's usual talking points -- like the fact that Russia has gone beyond its 1997 Kyoto Protocol targets (something others call fuzzy math that happened only because of the collapse of state-owned industry, not any proactive attempt to address climate change), many say the mood here is markedly different. "At the COP, Russia came with almost nothing, but I think with the position to keep the status quo for Russian internal energy policy," Chuprov said. Meanwhile, there has been massive outreach to Russia on the side. A European negotiator told ClimateWire that German Chancellor Angela Merkel met with Putin and, the negotiator said, he "promised to not be a spoiler" in Paris. President Obama spoke with him on the sidelines of the Paris conference. And, sources said, even Dan Reifsnyder and Ahmed Djoghlaf, the diplomatic team of co-chairs leading the draft of the agreement, traveled to Moscow early in the process to make sure the Russian climate team knew its views were valued. Claudia Salerno, Venezuela's lead negotiator here, said the overall mood in these final days is tense but said all countries are sincerely trying to work together and not allow feathers to get ruffled. At a meeting last night to discuss fairness, Russian officials complained that they didn't have a microphone -- something that in different times could have led to a nightlong battle. This time, she said, "The U.S. said, 'Sit here!'"